March 27, 2015 - Dandelions for dayz. August 20, 2016 - Cooling off in the front yard after another day's walk. Man in car: "Hi! Where's your dog?" Me: [draws a deep breath] "Oh, he passed away." Man and woman in car: [overlapping] "Whatttt? Oh no! That's so sad. I'm so sorry. He was such a good dog!" Me: "Thank you. He had a long, lovely life." 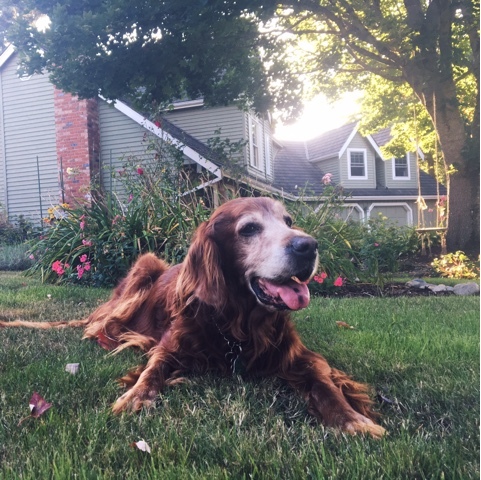 Over three months have passed since Ranger died. I continue to encounter strangers about once a week who ask after him. I am so amazed by the impact that my dog made on the world and so honored that I was Ranger's human.